As I've written before, when I had a college course in the history of the novel, the syllabus was headed "Fathers of the Novel." And, of course, chief among those "fathers" was Henry Fielding, the author of, most famously, The History of Tom Jones, a Foundling (1749). But I didn't learn for decades that Henry Fielding's sister, Sarah, was also a novelist--she certainly wasn't part of my college syllabus. 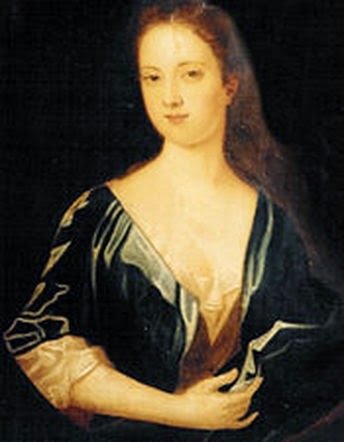 Rather than the Eton education her brother received (Henry Fielding also studied law at the University of Leiden), Sarah Fielding was sent to a girls' boarding school in Salisbury. As she would later write, the "education" offered to girls in such schools was minimal; they were taught "to read and write and to talk French and dance and be brought up as gentlewomen." Later, under the guardianship of her maternal grandmother, she had a tutor who taught her Latin and Greek. Sarah's first published work was a letter, from "Horatio" to "Leonora," included in her brother's The History of the Adventures of Joseph Andrews (1742). In the next year, her fictionalized story of Anne Boleyn was included in Henry Fielding's A Journey from This World to the Next, collected and published in his Miscellanies. 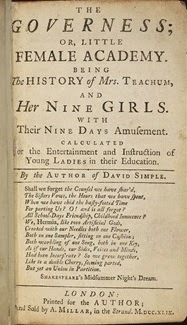 Her first novel, The Adventures of David Simple, followed, in 1744--it was published anonymously, its author attributed as "a lady" and prefaced by a note indicating that "distress in her circumstances" motivated her publication. The novel proved so popular that it was followed by an epistolary sequel, Familiar Letters between the Principal Characters in David Simple in 1747 and, in 1753, a concluding novel in the series, David Simple: Volume the Last. Sarah Fielding had always written, at least in part, to earn money--and by 1754, her brother, who had also written as a way of providing income for his family, had died. She struggled with poverty for the rest of her life, completing four major works before her death in 1768. The first, published in 1757, was a fictional double biography, or, rather, "autobiography," The Lives of Cleopatra and Octavia, autobiography because the two, Cleopatra and Octavia, told their own stories from "beyond the grave." I am obliged to fortune for the papers I now offer to the public. I little imagined when I bought an old bureau that I was purchasing a work of fancy, for such I must suspect this little work to be . . . I have not been able by any inquiry to find out the author or the lady to whom it was addressed, but I hope I shall not give offence to either of them by the publication. . . . In the novel that follows, a young woman writes her story to an unnamed female correspondent--the whole of the novel is one extended letter. Sarah Fielding's last publication was her translation of Xenophon's Memoirs of Socrates, published in 1762; this was the only one of her works published under her own name. The title notes its author as "Sarah Fielding." As Sabor notes, "Fielding, who had been tutored in Latin and Greek by Arthur Collier[,] was one of the only women in England with sufficient Greek" to be able to complete such a translation." In her own letters, Fielding seems to suggest that the work for which she wished to be remembered was this translation. 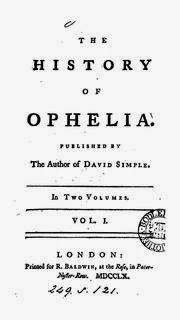 I think, however, that for today's readers, her novels, in particular The History of Ophelia, are most engaging, for they address the social and economic issues facing women in the late eighteenth century. In his entry on Sarah Fielding for the Oxford Dictionary of National Biography, Clive Probyn notes that in her novels Fielding "clearly focuses on the powerlessness of the unhappily married woman who, because of economic dependence, becomes the easy victim of patriarchy." Fielding's works are now easily accessible online at sites like Project Gutenberg and the Internet Archive, and there are various print-on-demand reprints available. But I particularly like the Broadview Editions, which are not only affordable but well edited and introduced: Sabor's edition of The History of Ophelia and Candace Ward's edition of The Governess are excellent. There is also a Penguin edition of The Adventures of David Simple by Linda Bree, who has also published a critical introduction to Sarah Fielding's work.